Louise grew up on Mount Pleasant Avenue in what later became the home of K.C. Irving. She spent many happy summers on the St. John River at the family lodge on Caton’s Island. Louise’ father, Howard Robinson, was an influential figure in the couple’s lives. As a successful entrepreneur, businessman, mentor and friend of well-known public figures of the forties and fifties, Mr. Robinson was inducted into Junior Achievement New Brunswick’s Business Hall of Fame in 2004. The Financial Post listed him as the 10th most influential and powerful businessman of his time. The Atlantic Business Magazine placed him in their all-time top twenty Atlantic business leaders as “an innovative competitor in the emerging radio and television industry, pulp and paper, energy, print media and telecommunications sectors” … on whose shoulders latter-day industrial giants stood. During the Second World War, Lieutenant Commander Black served almost six years in the Royal Canadian Navy which included three years to the Royal Navy in Brittain, the Mediterranean and the Middle East and in minesweeping operations on Halifax convoy approaches. Later, Commander Black served for five years, as Commanding Officer of HMCS Brunswicker, the New Brunswick Naval Reserve’s Training Division. After the war, his naval career presented opportunities to continue to serve his country as aide de camps to two New Brunswick Lieutenant Governors, the Honourable Leonard O’Brien and the Honourable D.L. MacLaren and briefly, for Governor General, His Excellency Major General, the Honourable Georges Vanier. Commander and Mrs. Black had many interesting experience as they accompanied the Vice Regal representatives to special events. They both knew and admired Lord Beaverbrook. Louise has many childhood memories of him and his frequent visits back to his native New Brunswick and gatherings with her father and other luminaries of the era. Mr. Black recalls being with Lieutenant Governor O’Brien for Lord Beaverbrook’s eightieth birthday at a North End school in Saint John where he addressed several hundred children. Many of them benefited from the Lord Beaverbrook Rink he donated to the community’s children. 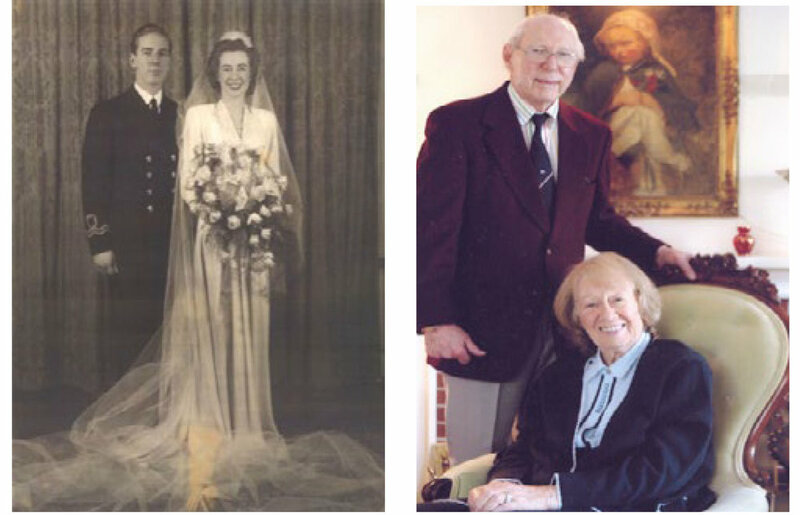 Roland and Louise Black were united in marriage in 1945 at St. Paul’s Church on Garden Street in Saint John, New Brunswick. They made a handsome couple, he, as a distinguished naval officer, and she, as a beautiful young woman with deeply rooted New Brunswick family ties. Natives of Saint John, the Blacks have made it their life-long home. Mr. and Mrs. Black were part of the Vice Regal Party when Governor General Georges and Mme. Vanier came to Saint John in the sixties. They have vivid memories of touring the Byng Boys building on Milford Road in Saint John West before it was destroyed by fire. Mr. Black describes his membership in a unique veterans group, the “Byng Boys Club” as bittersweet. The group was founded to honour His Excellency Governor General Julian Byng, a respected and beloved World War I General. The Byng Boys have surpassed the eighty-five year mark, but its veteran members are becoming fewer as time progresses. In 2007, they decided to disband, donating a substantial collection of memorabilia and World War I and World War II artifacts to Canadian museums for posterity. Over the course of the post war years, technology brought many rapid changes. Throughout an extensive business career, Mr. Black, with Louise’s support, demonstrated an amazing talent for identifying business ventures in new and undeveloped sectors. The telecommunications sector, particularly the telephone, was evolving quickly. Companies were requiring a presence around the clock, seven days a week. Mr. Black’s venture, Telephone Answering Service, responded to this need. For over twenty-five years, it grew and flourished. temporary personnel. Filling human resource requirements in skills development, testing, training and temporary work, he spawned his company “Office Overload” into an active Canadian company with over one hundred staff. The Blacks have had an abiding interest and love of music throughout their lives. It wasn’t expected that it would lead to yet another successful venture. Many commercial locations were attracted to the concept of background music. It became popular in hotels, elevators, offices, lobbies, etc. and came to be known as “Muzak.” “Timing is everything,” adds Mr. Black. It was a key element in his many successful business ventures over the years. The Blacks have a son, Dr. John R. Black, who earned a Doctor of Science in Engineering at M.I.T. and has followed in his father’s footsteps as an outstanding businessman. For some years, John and his family resided in Pennsylvania. They now make their home in Chicago, where he holds a senior management position with the Aluminium Company of America. The Blacks successfully combined recreation and business for many years as they pursued their love of sailing and made many American sailing friends. Boating took them up and down the Atlantic coast, where they spent many summers. Louise acquired substantial sailing skills, even taking part on long ocean cruises to Florida, the Bahamas and the Caribbean, and was noted for her abilities at a time when few women achieved such expertise. Over the years, Mr. Black was also involved and contributed his volunteer time to community endeavors. He served as a director of the New Brunswick / Prince Edward Island Corps of Commissionaires, was a director of the YM-YWCA, the Tuberculosis Association (East Saint John Hospital), the Royal Kennebecasis Yacht Club and the Old Port Cove Yacht Club of Palm Beach. Mr. and Mrs. Black continue to generously support charitable causes in the community they love through the permanently endowed Roland and Louise Black Fund which was entrusted to the Greater Saint John Community Foundation in December, 2006.